The solution for cold loading on the conveyor. 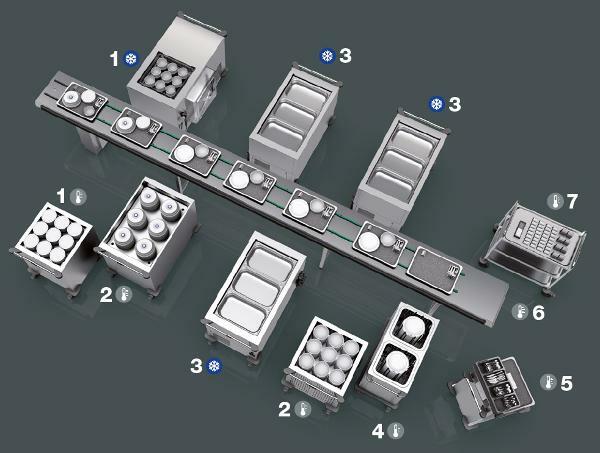 Whether pre-portioned or in containers: with the convection cooling that can be regulated down to the degree, food stays in the HACCP-compliant range until it is distributed on the conveyor. Dishes like plates or soup or stew bowls can be stored in the functional dispensers with cooling slits until shortly before they are needed in the refrigerated room – the pre-cooled dishes also help you to maintain the required food temperatures during portioning. The speed of the flat-belt or round-belt conveyors by BLANCO Professional can be precisely adjusted to your workflow (2.5–12 m/min). High-quality stainless steel and quality-conscious processing also ensure simple cleaning and first-class hygiene standards.